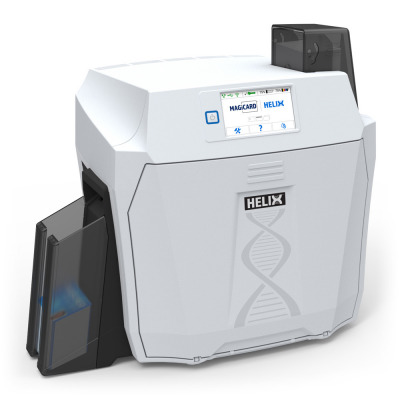 The Magicard Helix ID card printer is a unique retransfer printer designed to issue highly-secure badges on demand. The Magicard Helix printer is equipped with a 200-card feeder and a 200 output hopper to help your print cards in batches. The Helix personalizes 125 cards per hour single-sided YMCK (<30 secs) and 200 cards per hour single-sided monochrome. The Magicard Helix ID card printer features a state-of-the-art intuitive touch screen interface with print preview and troubleshooting animations. Get instant access to videos and support to minimize downtime and print perfect badges consistently. The Magicard Helix ID card printer also features easy load film cassettes to eliminate contamination. Available with 10 watermarks as standard, any of these watermarks can be replaced with your own customized design or company logo through an easy-to-use, but securely encrypted, online delivery method. The printer comes standard with a Kensington lock. Options include user log-on, secure film cassettes, secure blank media feeder, secure card reject hopper, and ribbon erase facility. The Helix is a single-sided printer that can be easily field upgraded to duplex printing with a simple drop-in upgrade ribbon. The Magicard Helix is fully compatible with Windows XP, Vista, 7, 8.1, 10 (32 and 64bit) Windows server 2003 R2 SP2, 2008, 2012, 2016, GNU/Linux and Mac OS X. The Magicard Helix single-sided ID card printer is backed with Magicard’s industry-leading 3 year UltraCoverPlus warranty with lifetime warranty on the printhead. Color depth: 16.7 million colors, Resistive touchscreen. Interface USB 2.0, 10 BASE-T/100 BASE-T Ethernet. Extendibility Internal 4 port USB HUB (1.1). (1x WiFi option, 1x encoder option, 1x Micro SD option, 1x unassigned). Laminator Laminator in-line (double-sided) option (available 2016). (ISO 7816 & EMV), Contactless (MIFARE, DESFire, ProX, HiD iCLass, TagIT, Legic, UHF. Printer security Standard: Kensington lock. Security watermark Standard HoloKote with UV effect (10 standard designs) — for use with secure dye film only. Customized watermark Custom HoloKote with UV effect — ordered separately and for use with secure dye film only.